Worshippers chant slogans against America, Israel and Saudi Arabia, as one of them holds up an anti-American placard, in a rally to condemn the Sept. 22, 2018 terror attack in Ahvaz, after prayers in Tehran, Iran, Sept. 28, 2018. Armed conflict between Iranian security forces and separatist militants on the Iranian border is growing, as the government tightens its grip on the minority population. With a population of more than 80 million people, Iran is predominantly ethnic Persian. The country's religion is Shi'ite Islam, and it is home to millions of ethno-religious minorities, including Kurds, Azeris and Baluchis. Iran's media Tuesday reported that 14 members of the Iranian security forces were abducted by militants near the southeastern province of Sistan-and-Baluchestan, which shares a border with neighboring Pakistan. The Baluch separatist group Jaish al-Adl (Army of Justice), claimed responsibility. In a statement, the Islamic Revolution Guards Corps (IRGC) blamed "terrorist groups led and backed by foreign services" for the kidnappings. 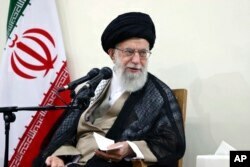 It asked Pakistan to protect its western borders and facilitate the release of the abducted Iranian forces. On Friday, the Kurdish separatist Kurdistan Democratic Party of Iran said its fighters engaged in a "three-hour confrontation with the Iranian forces in Kermanshah province." At least two Kurdish fighters and one civilian were killed, according to the statement. Iranian officials, who say the violence on the border is an isolated incident, are blaming the United States and its allies, particularly Saudi Arabia, for the unrest in parts of the country. U.S. and Saudi officials have rejected the accusations. In this picture released by an official website of the office of the Iranian supreme leader, Supreme Leader Ayatollah Ali Khamenei attends a meeting with judiciary officials, in Tehran, Iran, June 27, 2018. Iran's Supreme Leader Ayatollah Seyyed Ali Khamenei last month accused the U.S. and its "puppets" of plotting to create insecurity in Iran. 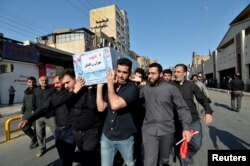 His comments were in response to the deadly attack in September on a military parade in the southwestern city of Ahvaz in which 25 people were killed. The Islamic State and the Ahvaz National Resistance, an Arab separatist group, both claimed responsibility for the attack. 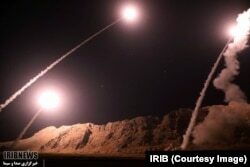 Earlier this month, IRGC announced it had fired six missiles at militants near the Euphrates River where IS is active, only weeks after its missiles hit the headquarters of the Iranian Democratic Party of Kurdistan in the northern Iraqi city of Koya. Iran’s Islamic Revolutionary Guard Corps fires missiles from the western province of Kermanshah on October 1, 2018. It said the targets were militants in the eastern Syrian town of Albu Kamal. A U.S. State Department official told VOA that Washington is "not supporting Kurdish military activity" against the regime in Iran, but it accused Iran of working to "maintain a pattern of malign behavior in the region." "Our activities in Iraq stand in stark contrast with those of the Iranian regime, which is working on a daily basis, through violence and intimidation, to subvert the will of the Iraqi people and undermine Iraq's sovereignty," the official added. The Iranian government has come under domestic and international criticism for its treatment of minorities. Saleh Hamid, the Sweden-based representative for the Ahwaz Human Rights Organization, said Tehran has increased acts of discrimination and repression against minorities, particularly against the Arab-speaking population of Ahvaz. The "Islamic Republic is insisting on the idea that the Arab-speaking minority could get their palms easily greased by the Arab states because of cultural and linguistic similarities," Hamid said, adding that the government has increased its crackdown following the September attack in Ahvaz. "The pressure is so immense that even Arabic poetry night events have canceled their gatherings, fearing they could be arrested and sent to unknown jails," he said. People carry a coffin during a funeral of the victims of assault that killed 25 people, in the streets of the southwestern Iranian city of Ahvaz, Iran Sept. 24, 2018. According to Iranian Kurdish writer and activist Abdullah Hijab, Iran's recent curb on minorities is due to its fear that the separatist groups could be used by the U.S. and its regional allies following the American withdrawal from the Iran nuclear deal in May. "Regime officials are concerned that U.S. sanctions could further destabilize Iran and bring about a movement for change within Iran. They are using the American threat as an excuse to suppress any anti-regime activity throughout the country," said Hijab. U.S. Secretary of State Mike Pompeo last month said U.S. President Donald Trump's strategy after leaving the deal was to force a change in Iran's "behavior." 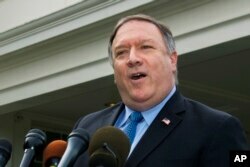 Pompeo has repeatedly said the United States is not trying to change the regime. "We are fighting for human dignity of the Iranian people by speaking the truth about the oppressive and corrupt regime that controls those people," Pompeo said during remarks at the 13th Annual Values Voter Summit on Sept. 21. "Religious minorities in Iran are routinely imprisoned, stripped of their rights, kicked out of their jobs and subject to many other abuses," he added. 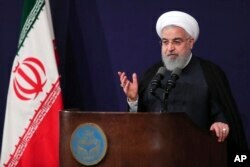 Iran's President Hassan Rouhani has, however, denounced the U.S. actions as seeking "regime change." "In the past 40 years, there has not been a more spiteful team than the current U.S. government team toward Iran, Iranians and the Islamic Republic," Rouhani said in a speech broadcast Sunday on state TV. Experts charge that the rising tensions between Iran and the U.S., and Saudia Arabia's concern about Iran's ambitions in the Arab countries, would likely empower the country's various separatist movements in the future. Alex Vatanka, a senior fellow at the Middle East Institute, believes Iran has a history of mistreating minorities, and the different ethno-religious grievances have often been used as leverage by Iran's enemies. "I think unfortunately, this semi-Cold War between Tehran and Riyadh is in a stage that the two countries are taking every chance to harm each other, from Twitter vitriol to a war of proxies," Vatanka told VOA. "Given the fact that the Saudis are threatening Tehran of bringing the war into Iranian borders, it is not fantasia to assume that these minorities could be a target by the Saudis or other rival states," he said.